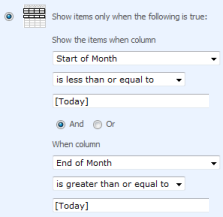 On the Advanced SharePoint View and Filter techniques post Ed asked how you could filter for the current calendar month rather than a rolling 30 day period (for example all tasks due this calendar month). Like all great questions it seemed simple enough – something like only showing items where the Month and Year of the due date = the Month and Year of the current date. 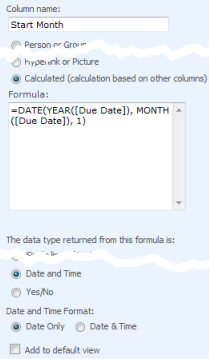 Alas, we can’t use [Today] in calculated columns and we can’t use functions like Month([Due Date]) in the filter – so this approach will not work. The solution is to turn this on its head – its a bit weird, so bear with me! We need to have two calculated fields, one showing the first day of the month that the due date is in and one showing the last day of the month that the due date is in. In this diagram the current date is 15th Nov (the orange dotted line). To put this into SharePoint open your list, click Settings > List settings > Create Column and setup the following two columns. View a few records to check the formula is working OK and you see the correct dates. You can use this with date fields other than [Due Date] – e.g. [Created] for items created in the current month, [Modified] for items well… urm… modified in the current month! I should make clear that this technique will not work correctly on Event lists with recurring event as SharePoint only records the start time of the first event, not each occurrence in the series. Just wanted to let you know that the “Date and Time Functions” link under References goes to an error page. Thanks for the informative article! My boss wants a twist on this, but I’m not sure this method will even work for it. We have an Advertising Calendar which shows when our confirmed marketing events will happen. At the bottom of each month’s page, she would like a list web part that filters to show only upcoming, non-scheduled items for that month. For example, when you are in January, the web part would show the info for all items where a “Month” column matches “January”. If you switch to February in the calendar, then the web part would filter to show only items where the “Month” column matches “February” and so on. Could this be set up to show the next 3 months? 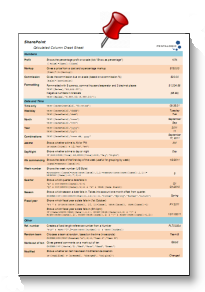 I want to set a filter which shows all the content where deadline is from today to end of the wee. how to set that up. This is Awesome…thanks for the great tip!